The best way to keep your tack room organized! I love keeping all of my horse coat care supplies together. Horse grooming kits are the perfect way to do this, so when we saw this bag in a tack shop my husband bought it for me. It came pre-stocked with a few items, some are still in it, but many I have replaced with brushes and tools that I like better, or that the horses prefer. 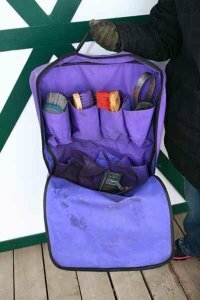 I’ll share with you some of my favorite horse grooming brushes, and tell you why each one has a place in my horse grooming tote. These are my personal choices, by no means are they the only items that you should use, or that you may need. I find around the barn that different people and horses have different needs and preferences. I don’t even use the same brushes for all three of our horses...like people, they have their own tastes when it comes to grooming! 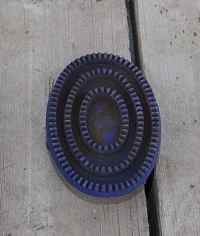 This plastic curry comb comes in handy in the spring especially, for loosening caked on mud that’s clumped all over the horses. It is fairly hard, so it’s best not to be used to deep. You’re not really trying to brush all the way down to the skin, but just take short and quick strokes to free the debris from the hair. Plastic curry combs are popular with my palomino quarter horse Selene, who like to lean into the bristles for a good scratch. 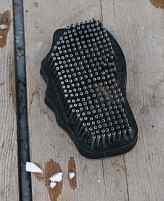 The rubber curry comb can also be used for removing dried mud. What I like about it is how the jagged rubber teeth collect hair. 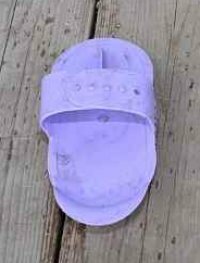 Our horse Comet is strictly opposed to the shedding blade, so this is what I use to help him shed in the spring. Because the teeth are open and further apart than the bristles on most horse grooming brushes it’s extremely easy to pull the hair out of the brush...something you don’t want to spend much time doing, when you’ve got a 1200 lb. gelding to shed! This is a stiff bristled dandy brush. It is great for whisking away the dirt once you’ve loosened it from the hair with a curry comb. Dandy brushes can have also have soft bristles. These are used for more delicate parts like the belly and legs. 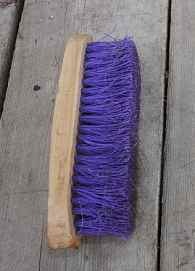 Face brushes often look similar to a dandy brush, but are smaller, and have very soft bristles, often made out horsehair. Horsehair brushes can be used on all parts of the body. 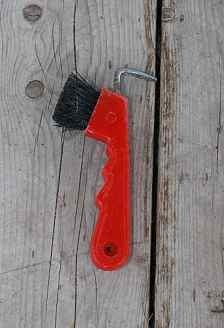 A horse hoof pick with a hoof brush is another essential item in my horse grooming kit. 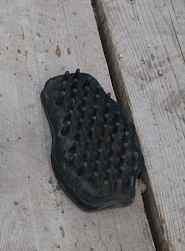 It’s a good idea to not only pick out the hoof with the hoof pick, but to also use the hoof brush to clean away dirt and debris, so you can get a good look at the bottom of your horses foot, and also the hoof wall. If you are going to apply a hoof cream or treatment having a clean surface to apply it too is helpful, and it keeps your applicator brush and hoof cream jar from getting full of dirt! This hard rubber brush has thick blunt bristles with lots of space in between. It is a good massager, and it also helps collect horse hair in the spring. Our horses seem to enjoy having it rocked and pressed into their larger muscles, but who doesn’t love a good massage now and again! If you haven't given your horse a massage lately, today might be a good time! This brush has bristles made of extremely soft and flexible rubber. It is much more subtle than the above brush. I highly recommend this brush for all horse grooming kits! It is gentle enough to be used on your horse’s delicate face and ears. Our horse Comet, by far the most sensitive of our three horses, prefers this horse brush to any other. It fits nicely into your hand, making it easy to hold and use. 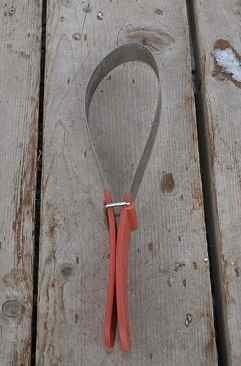 This metal shedding blade comes in so handy in the spring. Especially here in Canada where our horses grow long, and very thick winter coats. We don’t blanket them, but mother nature keeps them warm! The shedding blade can be used in one hand when it’s folded up as in the picture, or you can open it up and use it with two hands. Care should always be taken when using a metal shedding blade not to push to hard, and to pay close attention to your horse’s reaction for any signs of discomfort. While the teeth are very tiny, they can still cause discomfort if the are getting close to the skin. I generally only use this tool during the heaviest shedding times, when there is literally bagfuls of hair coming out rapidly. After that I switch to using the rubber curry comb to finish up. Horse fly spray of some kind is often found in horse grooming kits. It seems almost impossible to keep the horses totally protected from mosquitoes and flies, and while they try and find relief in the shade and the trees, the bugs find a way of driving them crazy! Insect repellents and fly sheets provide some relief at least. 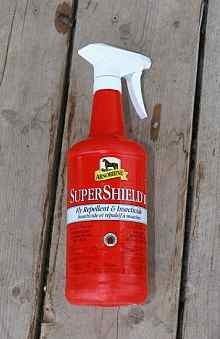 There are many types of horse fly spray available, including natural products. It is also very easy to mix up your own natural fly spray, which is great, because then you aren't using chemical insecticides, and it you don't have to worry when the spray blows into your face or eyes. Your horse will be shiny, soft and smell great too! I hope you enjoyed taking a peek inside one of our horse grooming kits! There are lots of great tools out there to help make horse coat care an easier job! What's In Your Horse Grooming Kit ? What are your favourite horse grooming supplies? Tell us about the best combs, horse brushes, or your favourite brand of horse shampoo! Do you have some pictures of your products, or maybe some funny pictures of you giving your horse a bath, or buried in piles of horse hair after shedding? You can upload four of your best pictures with you and your horses!!! Can't wait to see them! Curry combs, metal curry, body brush, dandy brush, fly spray, hoof pick, hoof clippers, trimmers, horse shampoo, shedding blades, and a lot more!